What gave you the idea of starting an online B2B marketplace? 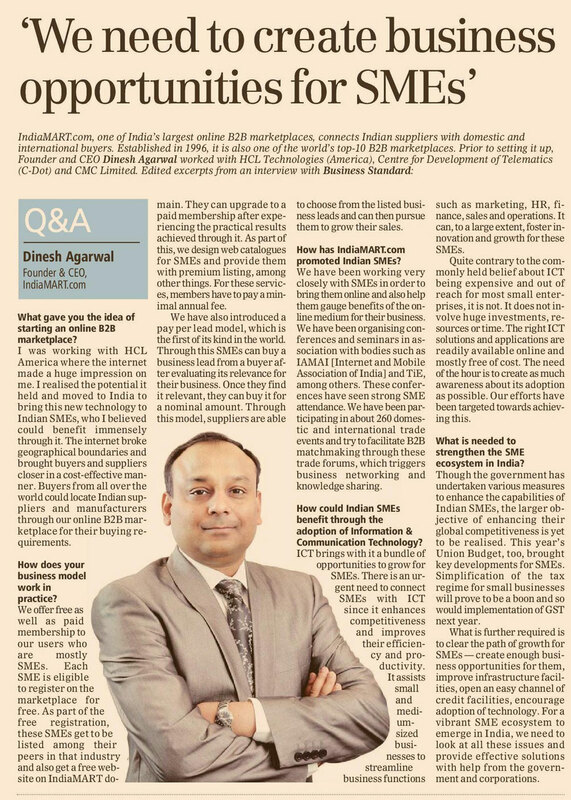 I was working with HCL America where the internet made a huge impression on me. I realised the potential it held and moved to India to bring this new technology to Indian SMEs, who I believed could benefit immensely through it. The internet broke geographical boundaries and brought buyers and suppliers closer in a cost-effective manner. Buyers from all over the world could locate Indian suppliers and manufacturers through our online B2B marketplace for their buying requirements. How does your business model work in practice? We offer free as well as paid membership to our users who are mostly SMEs. Each SME is eligible to register on the marketplace for free. As part of the free registration, these SMEs get to be listed among their peers in that industry and also get a free website on IndiaMART domain. They can upgrade to a paid membership after experiencing the practical results achieved through it. As part of this, we design web catalogues for SMEs and provide them with premium listing, among other things. For these services, members have to pay a minimal annual fee. We have also introduced a pay per lead model, which is the first of its kind in the world. Through this SMEs can buy a business lead from a buyer after evaluating its relevance for their business. Once they find it relevant, they can buy it for a nominal amount. Through this model, suppliers are able to choose from the listed business leads and can then pursue them to grow their sales. How has IndiaMART.com promoted Indian SMEs? We have been working very closely with SMEs in order to bring them online and also help them gauge benefits of the online medium for their business. We have been organising conferences and seminars in association with bodies such as IAMAI [Internet and Mobile Association of India] and TiE, among others. These conferences have seen strong SME attendance. We have been participating in about 260 domestic and international trade events and try to facilitate B2B matchmaking through these trade forums, which triggers business networking and knowledge sharing. How could Indian SMEs benefit through the adoption of Information & Communication Technology? ICT brings with it a bundle of opportunities to grow for SMEs. There is an urgent need to connect SMEs with ICT since it enhances competitiveness and improves their efficiency and productivity. It assists small and medium-sized businesses to streamline business functions such as marketing, HR, finance, sales and operations. It can, to a large extent, foster innovation and growth for these SMEs. Quite contrary to the commonly held belief about ICT being expensive and out of reach for most small enterprises, it is not. It does not involve huge investments, resources or time. The right ICT solutions and applications are readily available online and mostly free of cost. The need of the hour is to create as much awareness about its adoption as possible. Our efforts have been targeted towards achieving this. What is needed to strengthen the SME ecosystem in India? Though the government has undertaken various measures to enhance the capabilities of Indian SMEs, the larger objective of enhancing their global competitiveness is yet to be realised. This year’s Union Budget, too, brought key developments for SMEs. Simplification of the tax regime for small businesses will prove to be a boon and so would implementation of GST next year. What is further required is to clear the path of growth for SMEs — create enough business opportunities for them, improve infrastructure facilities, open an easy channel of credit facilities, encourage adoption of technology. For a vibrant SME ecosystem to emerge in India, we need to look at all these issues and provide effective solutions with help from the government and corporations.